One of Colorado's biggest claims to fame — literally — is its 58 fourteeners: Rocky Mountain peaks that rise more than 14,000 feet above sea level. These sky-scraping mountains make us the tallest state in the nation and lure hikers and photographers anxious for that amazing photo and bragging rights for summiting their heights. Check out an awesome infographic that describes what makes them so special to Coloradans. Pikes Peak, Rocky Mountain National Park's Longs Peak, Mount Evans, the Maroon Bells and Mount Sneffels are five of Colorado's most popular and most photographed mountains. And they're so beautiful, even the novice photographer will look like a pro. Mount Elbert is the tallest mountain in Colorado, coming in at 14,440 feet. It's also the second-highest peak in the contiguous United States. With such honors, you can imagine that the Sawatch Range peak is popular with climbers and hikers. Reachable from the home bases of Leadville and Twin Lakes, one of the best ways to see the peak (and its neighbor, Mount Massive) is from the window of the Leadville Colorado & Southern Railroad. Hikers are lucky, as there's a 4.5-mile trail that goes all the way to the lofty summit — though with an elevation gain of more than 4,500 feet along the way, they may not feel so lucky. Location: The north Mount Elbert trailhead is located off the Halfmoon Road southwest of Leadville, just past Elbert Creek Campground. 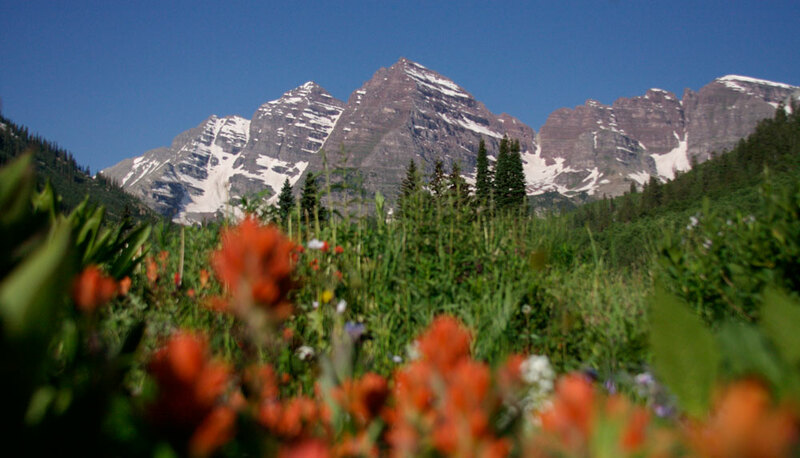 It’s said that the Maroon Bells (actually, two peaks: Maroon Peak and North Maroon Peak) are the most photographed peaks in Colorado's Rocky Mountains, and when you see them, you’ll understand why. With a reflective lake to cast back their beauty and a crystalline blue sky to frame their edges, the pyramid-like peaks of these sister mountains are a photographer’s dream. The naked faces of these often snow-dusted behemoths stand in contrast to the lush greenery of conifers and brillieant wildflowers that grow in their shadows. Maroon Bells hikers and bikers can access to a moderate 1.5-mile trail that rings the lake and provides many areas to stop and snap a shot. During the busy summer months, a shuttle from Aspen Highlands runs 9am–5pm that is the only way to reach the peaks (you can drive there outside of those hours). Maroon Creek Road is closed during the winter, so cross-country skiing, snowshoeing or snowmobiling are the only ways in. Location: From Glenwood Springs, travel southeast on Highway 82. At 14,115 feet, Pikes Peak is a monolithic monument named for explorer Zebulon Pike, whose travels left an indelible mark on the psyche of the American people and the Rocky Mountains. While Pike himself was never able to reach its summit, he was the first documented pioneer to try. Infused with historic significance, a picture of this mountain is more than just a shot of scenery — it’s a glimpse into Colorado’s identity. If you have an adventurous spirit, drive the Pikes Peak Highway to get your shot. It has more than 150 turns that traverse the mountain face, each one providing a vista worth photographing. * Note: Due to limited parking at the summit due to construction of the Pikes Peak Summit Complex, visitors planning to drive to the top during the busy summer months (May through October) may be required to take a complimentary shuttle from designated parking lots along the highway. Location: Take Highway 24 west out of Colorado Springs. The centerpiece of Rocky Mountain National Park, Longs Peak regally stands at 14,255 feet. This odd-shaped peak juts up like an eroded box displaying both sharp corners and flat faces, including a flat summit. Thanks to these geometric angles, light and shadow compete throughout the day, providing dramatic contrasts and breathtaking photographs. Longs Peak takes its name from an explorer of the area, Major Stephen H. Long. In 1820, his group explored the Colorado territory’s newly defined northern boundary. Their party only witnessed this peak from afar, but even at a distance they found the largest mountain on the horizon fit to bear the name of their respected leader. When you encounter this Longs Peak, you’ll see why they were inspired to do so. For those looking for a "Longs Peak hike," you should look no further: Rocky Mountain National Park is careful to stipulate that there is no Longs Peak hike — it's a climb with vertical rock faces, narrow ledges and loose rock and should only be tackled by those experienced and prepared enough to do so. There is, however, a lovely hike within the park that offers great views and pics of the peak: The 2.8-mile Mills Lake trail is perfect for ogling Longs. Location: From Boulder, travel north on Highway 36 to Estes Park and Rocky Mountain National Park. There are few places in the world that you can motor over a mountain more than 14,000-feet high. In fact, at 14,260 feet, the route over Mount Evans leads you along the highest paved road in the United States. The road is closed and impassible due to snow from Labor Day to Memorial Day, but once it opens, bring your camera and be prepared for some of the most magnificent views you've seen. From the pinnacle of Mount Evans, views of the surrounding ranges and valleys capture the sheer greatness of the Rocky Mountains themselves. Learn about the Mount Evans Scenic Byway. Location: From Denver, travel west on Highway 70 to the town of Idaho Springs. From town, continue along Mt. Evans Road, past Echo Lake, to the peak. Mount Sneffels juts out of the earth like a mythical peak. High-alpine trees abruptly give way at timberline allowing the naked face of the 14,150-foot peak to loom over the landscape. This mountain sits in the extremely rugged Mount Sneffels Wilderness Area. If you’re able, grab your camera and take the time to explore on foot the pristine wilderness that surrounds this peak. There are no roads to this mountain, so set up your tripod on Dallas Divide Pass on Highway 62, just outside of Ridgway. Or for hike-in views, tackle the strenuous 14-mile Sneffels Highline Loop, which starts right in Telluride. Location (driving): From Telluride, travel along Highway 145 north, to the junction of Highway 62. Turn onto Highway 62 toward Dallas Divide Pass.